In 2007 there were more than 130 radio stations of various sizes around the nation . BRACS was introduced by the federal government in 1987. In 2008 there were 29 BRACS communities in the Northern Territory . Media associations such as CAAMA (Central Australian Aboriginal Media Association) or TEABBA (Top End Aboriginal Bush Broadcasting Association) represent the interests of BRACS community radio stations. In urban areas of Australia Aboriginal broadcasting consists of radio programs produced by Indigenous media groups and broadcast through regional ABC or public radio stations. Watch Green Bush, a short movie by Warwick Thornton which tells the story of an Indigenous DJ hosting a show for Aboriginal inmates and their families and the strange things that happen one night. Deadly Sounds was a national weekly Aboriginal and Torres Strait Islander music program. Beginning in 1993, it gave the Aboriginal community a positive voice in Australian media. It featured music, culture, information and sport, and supported a positive healthy lifestyle without too much alcohol and without drugs. The show was broadcast through the community radio network as well as the National Indigenous Radio Service to almost 200 stations across Australia. Sadly, from 1 July 2014, the Australian government stopped supporting Vibe Australia and with it Deadly Sounds. Australian Indigenous Radio (AIR) broadcasts nationally on Channel 29 on the Aurora Satellite. 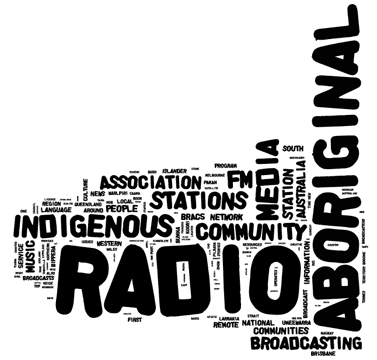 The Aboriginal radio service was specifically developed to reach 2,400 Aboriginal communities, broadcasting Aboriginal music, programming, content, community service announcements and Aboriginal information. The music and content is produced by Aboriginal broadcasters through the Radio Larrakia 94.5FM Darwin NT, Indigenous Broadcasting Training Program and follows the Aboriginal Cultural Protocols and Ethics for Broadcasting. AIR broadcasts in more than 40 Aboriginal languages. Australian Indigenous Radio is freely available to all Remote Indigenous Organisations (RIMOs) and Bush Radio Aboriginal Community Services (BRACS). The National Indigenous Radio Service in Brisbane aggregates material from Indigenous media organisations that don't have the staffing or capital requirements to provide 24-hour high quality broadcasting to their audience. NIRS supplies entertainment and information to all members who then retransmit the service when relevant. For over 30 years, NIRS has provided a radio programming and media marketing service for over 140 Aboriginal community radio stations. 2CUZ keeps the Indigenous and wider community around Bourke (600 kms north-west of Sydney) up to date with current issues and local information. Its programme includes Yuda Muka (meaning message stick in the local language), a current affairs show with local information for Aboriginal people. 93.7FM Koori Radio 2LND is Sydney's only Aboriginal and Torres Strait Islander full-time community radio station broadcasting a mix of local, international and assorted Aboriginal music from around the world and across Australia. Nimbin Aboriginal Broadcasters (NAB) is an an independent Koori radio broadcasting group that presents 12 hours of music a week at Nim-FM. NAB is a part of North Coast Aboriginal broadcasting and has been broadcasting in the Nimbin region area for 26 years. Central Australian Aboriginal Media Association (CAAMA) Radio is located in Alice Springs and was the first Indigenous radio station there. Freda Glynn, Phillip Batty and John Macumba founded CAAMA in 1980 in order to expose Aboriginal music and culture to the rest of Australia. Radio Larrakia 94.5 FM operates in Darwin and promotes the Larrakia Aboriginal language and Larrakia culture to Darwin, Palmerston, Cox Peninsular to Adelaide River, Humpty Doo and 26 surrounding Aboriginal communities. The station broadcasts news, sport and information. It's music is both contemporary and traditional Aboriginal, but also easy listening and country. Her easy-going music comforts like the breeze. A switch to the Dixie Chicks—something very sweet. And young Josh Thomas playing the blues. The TEABBA radio network is a collective of over 30 community radio stations known as RIBS (Remote Indigenous Broadcast Service). The main office is in Darwin. Stations are located at the major communities in the Top End of the Northern Territory and contribute program for broadcasting over the network. The Warlpiri Media Association, founded in the early 1980s, produces TV and radio broadcasts in Warlpiri language but also in English. Bush Mechanics was a very successful TV series. It operates the PAW radio network which spans 420,000 km² and delivers to the language groups Pintubi, Anmatjerre, Kaytetye and Alyewerre. The Aboriginal Resource and Development Services Inc (ARDS), an Indigenous, non-government, charitable organisation, established Yolngu Radio Service in November 2006 "to meet the information access, self-learning and adult education needs of the Yolngu people of north-east Arnhem Land". The station broadcasts on 1530 AM in Darwin and via a free-to-air signal on the Aurora satellite platform. 4MW claims to be "one of Australia's leading Aboriginal radio stations". The Torres Strait Islander Media Association (TSIMA), the organisation behind Radio 4MW, was set up on Thursday Island to give the local community an opportunity to have a voice, share their culture and to educate and inform Indigenous and non-Indigenous people of the positive aspects of Indigenous people and culture. BIMA Brisbane is the first Indigenous radio station in a capital city. It went first to air in April 1993. BIMA offers a blend of country and Aboriginal music and operates out of Yeerongpilly, QLD. 'Bumma' and 'Bippera' are two Aboriginal word taken from the Yalangi language of Cairns. 'Bumma' means the people of the rainforest and 'Bippera' means talking amongst ourselves. Bumma Bippera was granted a full time community radio licence in April 1999 when it became Cairns's first Indigenous radio and media service. The MDAIMA serves the Mackay region of Queensland and broadcasts on 105.9 MHz on the FM band. The program coverss a wide range of local issues that appeals to the Indigenous community in Mackay. Mount Isa Aboriginal Media Association (MIAMA) who operates MOB FM was established in 1982. In 1996 it was granted a radio licence and MOB FM 100.9 was born. MOB FM's main goals are to portray a positive image of Indigenous people, break down barriers, and continue its success as a professional radio station. There are 12 stations in the QRAM network, reaching more than 30 communities throughout regional and remote Queensland. Each local station combines their own local broadcasting with back up from the Black Star network service via broadband and satellite. Based in Cairns, QRAM also provides media and learning services support to Remote Indigenous Broadcasting Services (RIBS) in many remote Queensland communities. 4RR FM Mid-West Queensland provides the Indigenous community in and around Charleville, 400 kms west of Brisbane, with national and local news and information, specialised music programming and a significant voice for Aboriginal people since May 2005. Radio 4K1G FM Too Deadly is operated by the Townsville Aboriginal & Islander Media Association (TAIMA). It was established in 1972 to promote and broadcast Indigenous news, music, views and information and raise awareness to those amongst the broader community. 4US Radio 100.7 FM, Rockhampton, broadcasting started in the late 90's. PY Media started as Ernabella Video and Television (EVTV) in the early 1980s in Ernabella community (Pukatja), north-western South Australia. EVTV was initiated as a way to curb the saturation of commercial TV services with the launch of AUSAT. In 1987, members of the Anangu Pitjantjatjara Yankunytjatjara (APY) Lands decided that it was necessary to develop the same services provided by EVTV in all communities across the APY Lands. PY Media was incorporated as the regional body to assist communities to develop their own community media centres. In the mid-1990s PY Media moved out of Ernabella to Umuwa to set up a regional office that enabled fair representation for all communities on the APY Lands. Radio 5NPY Anangu Winkiku Satellite Network translates loosely as "everyone's satellite network". It was started in May 1998 and its network consists of eleven communities with their own BRACS (Broadcasting in Remote Aboriginal Scheme) radio stations that are hooked up to a central hub station in Umuwa. Radio 5NPY was initiated to allow these communities a chance to keep their own identity, but also to be part of a strong radio network that spans a footprint covering over one fifth of Australia's land mass. Umeewarra Media Radio's main studios are in Port Augusta from where they broadcast the National Indigenous Radio News. Umeewarra Aboriginal Media Association was founded in 1987 in Port Augusta. It began producing a 15 minute program for the ABC in 1989 which has since grown to 50 minutes a week. In February 1993 Umeewarra was granted a licence to broadcast which covers the eastern side of the Flinders Ranges, as well as the Aboriginal communities in Whyalla and Port Pirie. Umeewarra produces daily news, a Jobwatch program, an after school show, Documentary Time, Aboriginal current affairs, a sports program, a gospel program and a country music show. 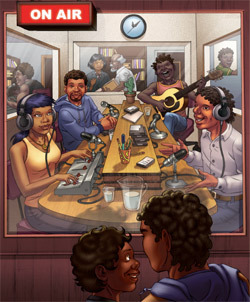 3KND (also known as the South East Indigenous Media Association, SEIMA) is Melbourne's first Indigenous radio station. It hit the airwaves in June 2003 and received its permanent broadcasting license in 2004. Aboriginal community radio station 1170 6AR broadcasts a unique format of sport and country and Indigenous music capturing an audience of Indigenous and non-Indigenous people 25 years and older. Sport includes AFL and exclusive Western Warriors commentaries. The station is located in Perth and claims to be the only Aboriginal station in town. Radio Goolarri in Broome supports traditional language, music and culture along with more contemporary art forms. It's a station where Indigenous people can tell stories in their own way. Radio Goolarri's owner is the Broome Aboriginal Media Association (BAMA). Derby Media Aboriginal Corporation commenced radio broadcasting on 1st March, 2003 on frequency 97.9FM. It broadcasts live-to-air to the township of Derby and nearby communities including Mowanjum. One of Radio 6DBY's projects is to capture and preserve Aboriginal stories before there is no-one left to tell them. NG Media has been operating now for 16 years and has its central hub in Irrunytju (Wingellina), WA. Ngaanyatjarra Media provides media and broadcasting support to 14 communities in remote Western Australia. 100.9FM Noongar Radio is managed by Noongar Media Enterprises (NME), a subsidiary company of Peedac, which is a not-for-profit Aboriginal Community Based Organisation. NME is an organisation which provides Noongar people the opportunity to have their voices heard through radio broadcasts in the Perth metropolitan area. Nyoongar Radio 100.9FM closed in 2006 in controversial circumstances but returned to the airwaves in April 2009. PAKAM is an association of Indigenous media producers and broadcasters based in Broome. Members operate thirteen BRACS (Broadcasting for Remote Aboriginal Communities Scheme) community television and radio stations and six larger town-based community radio stations. The PAKAM Radio Network provides a satellite-delivered regional service from the network hub in Broome, switching programme feeds from fourteen member stations and sending them to satellite uplink at Imparja Television in Alice Springs. PAKAM enables the sharing of news, information, special broadcast events, music and stories by all the Indigenous radio stations in the region and is retransmitted full time in 20 remote communities, scattered over a million square kilometres, with a total population in excess of 7,000. Radio Mulba represents the Aboriginal community of Port Hedland in the Pilbara region of Western Australia. While its content is predominately focused on Indigenous issues, the station also offers multicultural programs, as well as sending messages to remote communities. Tjuma Pulka Aboriginal Radio Station, based in Kalgoorlie-Boulder, went to air for the first time in October 2005. They transmit on 96.3 FM. Waringarri Radio 6WR broadcasts the latest music, news, weather and community information over a 300km radius around Kununurra in the remote East Kimberley region of far-north Western Australia. First Nations Media Australia is the national peak body for Aboriginal not-for-profit broadcasting, media and communications. It supports the Aboriginal broadcasting and media industry and provides essential media and communications services such as representation, research, member services, development and promotion.